Malaysia soccer squad lead by Datuk Ong Kim Swee marched to Incheon stadium, South Korea. The very first match is compete with Laos. 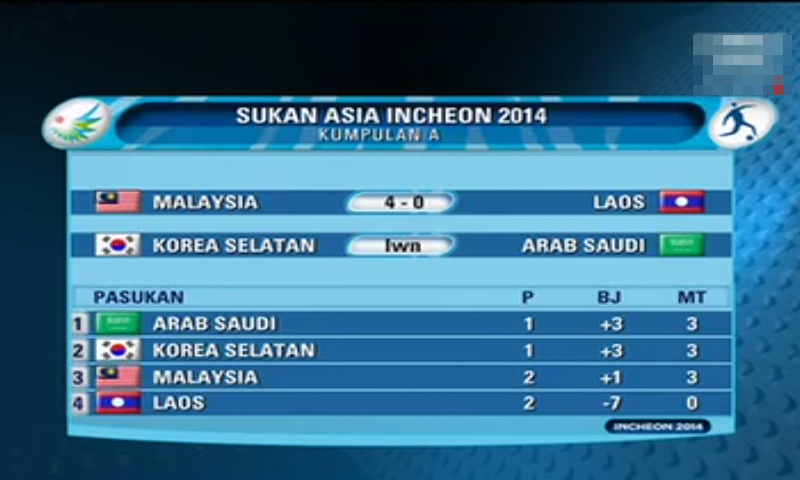 Last few days, Malaysia suffered defeat against South Korea national soccer squad in a friendly-match. South Korea squad strikers and defenses were both in a amazing form they had broke in defense of Harimau Malaya scoring 3 goals and stopped all the attempt to score a goal by Malaysia strikers. Malaysia versus Laos is the first soccer match for Malaysian soccer squad and they are determined to get first points by defeating Laos. Malaysian soccer fans are eagerly waiting the coming of date September 17, 2014. The match can be watched either at Astro Arena 801 or TV9. The time is set on 3.30PM. Dollah Salleh was presence at this match assessing the soccer players for upcoming AFF tournament on November later. The target for this match is 3 points set by Datuk Ong Kim Swee. At the first half of the match, A very high target and only able to be achieved if the coach call upon its strongest formation and players. Harimau Malaya U23 has lost three matches before heading versus Laos. Coach realized to give a surprise to opponent about its strength. Nor Farhan, Brendan Gan and Hazwan Bakri was playing at the field as potential goal scorers. As for defense side, there were Fadhli Shas (27) and Aidil Zafuan for perfect defense combination. In the first round of the match, Malaysia secured a goal by Aidil Zafuan at 12' minutes. The formation started to yield result after the second match where the three goals were scored. Second goal was scored by Nor Farhan (10) at 76' minutes followed by Mohamad Fandi (17) at 78' minutes. Subsequently, Farris Danial (25) scored at 81' minutes. Some of the players on the field were Ashri Chuchu (5), Gary (12), Amer (24), Zubir, Nazmi (31), Azrif (20).